The Art of Eating In. This is the tale of how the heroine, Cathy Erway, gave up eating out in New York for two years. She goes through all the different varieties of not eating out, from simply cooking at home, to supper clubs, to foraging and dumpster diving. Along the way she shares other details of her life: romance and heartache, new jobs and boredom, failures and discoveries. It's inspiring and demonstrates that anyone, anyone, can cook at home if they only have the desire and tenacity to do so. There are recipes included throughout, most that are more adventurous than I would normally make, and some that are extremely appealing to try right away. There are asian influences in many of the dishes, which makes sense as Cathy is half Chinese, and comes from a family in which experience and community are shared over delicious food of many varieties. As I generally try to cook at home, the concepts in this book weren't earth-shattering to me, but rather commiseratingly wonderful. I enjoyed following along with her cooking adventures, and was intrigued by the foraging chapter especially. 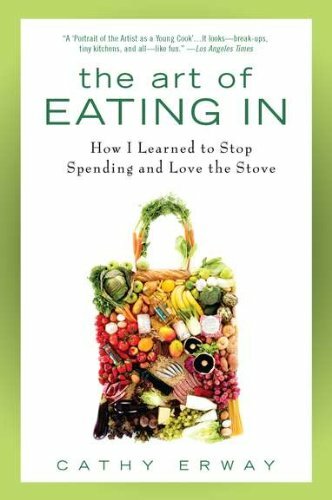 Overall, I would recommend this book to anyone with even a mild interest in either learning to cook or eating in more often. Great read.